Catheters were first used for intracardiac recording and stimulation in the late 1960s, but surgical treatment for refractory tachyarrhythmias was the mainstay of nonpharmacologic therapy until it was superseded by catheter ablation. The initial energy source used was direct current (DC) from a standard external defibrillator. A shock was delivered between the distal catheter electrode and a cutaneous surface electrode; however, this high-voltage discharge was difficult to control and could cause extensive tissue damage. RF energy, a low-voltage, high-frequency form of electrical energy familiar to physicians from its use in surgery (eg, electrocautery), quickly supplanted DC ablation. The relative safety of RF energy has contributed to the widespread adoption of catheter ablation as a therapeutic modality. RF energy produces small, homogeneous, necrotic lesions by heating tissue. Lesion size is influenced, in part, by the length of the distal ablation electrode and the type of catheter (standard vs saline-cooled). With typical power settings and good catheter contact pressure with cardiac tissue, lesions are minimally about 5-7 mm in diameter and 3-5 mm in depth. A curative procedure for atrial fibrillation (AF) is a major goal in clinical cardiac electrophysiology. Success has been achieved in patients with paroxysmal lone AF by eliminating conduction from the pulmonary veins to the left atrium, as many of these episodes are triggered by rapid electrical activity arising from tissue near the pulmonary vein ostia or from muscle sleeves surrounding the proximal veins. Other forms of AF may require some degree of substrate ablation (eg, linear transmural lesions in the left atrium). Techniques are evolving to address the challenge of a catheter-based cure for all forms of AF. Three-dimensional electroanatomic maps, overlaid on magnetic resonance imaging (MRI) or computed tomography (CT) scans of the left atrium, can facilitate navigation of the catheter and mapping of the arrhythmogenic substrate. Intracardiac echocardiography may also help in avoiding collateral damage to the pulmonary veins or esophagus, ensuring adequate endocardial contact, and monitoring for complications (eg, pericardial effusion and thrombus development). Alternative energy sources are being investigated in the ablation of AF (eg, balloon-based technologies using cryoablation,  ultrasound, and laser). In addition, robotic catheter navigation is now available to deliver RFCA. Research is also focused on developing better methods and tools for catheter ablation of ventricular tachycardia (VT), and even ventricular fibrillation (VF), in patients with structural heart disease. Epicardial electrophysiology via subxiphoid pericardial puncture is a relatively new frontier; some tachyarrhythmia substrates (especially VT in nonischemic cardiomyopathy) cannot be reached from the endocardium. There are three class I indications for catheter ablation. The first is symptomatic supraventricular tachycardia (SVT) due to atrioventricular (AV) nodal reentrant tachycardia (AVNRT), Wolff-Parkinson-White (WPW) syndrome, unifocal atrial tachycardia, or atrial flutter (especially common right atrial forms). For these conditions, catheter ablation is first-line therapy if that is the patient’s preference. The second indication is AF with lifestyle-impairing symptoms and inefficacy or intolerance of at least one antiarrhythmic agent. [6, 3] Both left atrial ablation for restoration of sinus rhythm and AV junction ablation for rate control are class I indications, depending on the circumstance. The third indication is symptomatic VT.  Catheter ablation is first-line therapy in idiopathic VT if that is the patient’s preference. In structural heart disease, catheter ablation is generally performed for drug inefficacy or intolerance or as adjunctive therapy in patients with an implantable cardioverter-defibrillator (ICD) who are experiencing frequent ICD discharges. RFCA has been applied to most clinical tachycardias, even to polymorphic VT and VF in preliminary studies. Success rates are highest in patients with common forms of SVT, namely AVNRT and orthodromic reciprocating tachycardia (ORT). Few absolute contraindications to RFCA exist. Left atrial ablation and ablation for persistent atrial flutter should not be performed in the presence of known atrial thrombus. Similarly, mobile left ventricular thrombus would be a contraindication to left ventricular ablation. Mechanical prosthetic heart valves are generally not crossed with ablation catheters. Women of reproductive age should not be exposed to fluoroscopy if any possibility exists that they are pregnant. RFCA of the AV junction results in excellent rate control, relieves palpitations, and improves functional capacity. However, patients who undergo this procedure require permanent pacemaker implantation to manage the resulting AV block and require warfarin therapy to prevent stroke because the AF itself is not affected. AV nodal modification is less therapeutic than AV junction ablation and may result in late heart block. Single-procedure success rates for curing AF with RFCA are as high as 80% for paroxysmal AF in the absence of structural heart disease and may be as low as 50% or less in patients with persistent AF in the presence of structural heart disease and left atrial enlargement. Repeat procedures are typically needed in at least 25% of patients and result in an increase in these success rates. Success rates for AF ablation have historically been based on patient symptoms and periodic electrocardiographic (ECG) monitoring. Success rates are lower if intensive ambulatory monitoring to detect asymptomatic AF recurrence is used, such as daily monitoring for a month with an auto-triggering event monitor. Some patients require the use of previously ineffective antiarrhythmic drugs to maintain success. The common forms of SVT (eg, AVNRT, SVT associated with WPW syndrome) are usually curable with a single procedure; the success rate is typically 90-95%. Cure rates for unifocal atrial tachycardia and common right atrial flutter are somewhat lower but still approach 90%. Recurrent tachyarrhythmias typically occur in the first few months after ablation and may be amenable to cure with a second procedure. 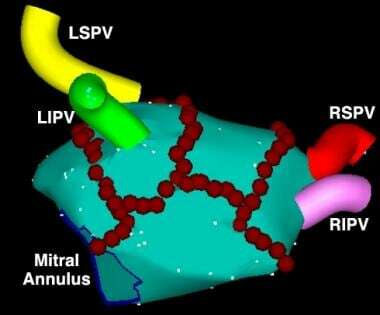 AVNRT is usually amenable to cure with a slow pathway ablation near the inferior atrial septum, where the risk of heart block is 1-2% with RF energy. In those uncommon cases where RF ablation near the compact AV node is required (eg, fast pathway ablation for AVNRT or an accessory pathway in a para-Hisian location), the risk of heart block may approach 5% or a little higher. In a number of centers, catheter-based cryoablation, rather than RFCA, is used near the compact AV node to minimize the risk of heart block. With cryoablation, heart block is generally reversible with prompt rewarming. However, cryoablation appears to be slightly less effective than RF as an energy source, especially for deep accessory pathways. Idiopathic VT is curable (success rate, ~80%), provided that it is readily inducible during the electrophysiologic study. The most common location for these VTs is the right ventricular outflow tract. Because these VTs are usually not reentrant in nature, a significant percentage are not inducible. Some cannot be ablated because of their deep septal location or their epicardial location near a coronary artery. Of patients with VT associated with structural heart disease, half to two thirds can obtain palliation with catheter ablation. Extensive scarring in these ventricles may limit the efficacy of the relatively small lesions made by RFCA, and multiple VT circuits may also contribute to this moderate success rate. In practice, many of these patients have implantable cardioverter-defibrillators (ICDs), and catheter ablation is used as adjunctive therapy for frequent device activations. For patients with structural heart disease and stable VT, the potential benefit of catheter ablation before implantation of an ICD was demonstrated in the Ventricular Tachycardia Ablation in Coronary Heart Disease (VTACH) study. This prospective, randomized, controlled international trial in 104 patients found that time to recurrence of VT or VF was longer in the ablation group (median, 18.6 months) than in the control group (5.9 months). At 2 years, estimates for survival free from VT or VF were 47% in the ablation group and 29% in the control group. The preprocedural evaluation always includes a thorough history and physical examination, as well as a review of electrocardiograms (ECGs; 12-lead, if available) obtained during the tachycardia and in sinus rhythm. At a minimum, preprocedural blood work typically includes a complete blood count and an assessment of renal function and electrolyte levels. An echocardiogram is frequently obtained to exclude structural heart disease. Other tests that are indicated in specific situations include exercise testing with or without cardiac imaging (especially for exercise-induced tachyarrhythmias), and cardiac catheterization. Catheter ablation typically requires that the patient be under conscious sedation with intravenous tranquilizers and narcotics. General anesthesia is used in children and selected adults. After generic supraventricular tachcardia (SVT) ablation or idiopathic ventricular tachycardia (VT) ablation, some physicians empirically treat patients with 4 weeks of aspirin therapy with the aim of potentially reducing the risk of thromboembolic sequelae. Anticoagulation with warfarin or one of the newer agents is typically employed for at least 1 month after ablation for patients presenting in persistent atrial flutter and for 3 months after left atrial ablation for patients with AF. Echocardiography is not routinely performed unless a complication (eg, pericardial effusion) may have occurred. Postprocedural electrophysiologic testing is not routinely performed unless recurrent tachyarrhythmias are suspected. Typically, two to five electrode catheters are percutaneously inserted via the femoral or internal jugular veins and are positioned within the left heart, the right heart, or both. Multiple catheters are needed to induce and map various tachyarrhythmias before radiofrequency (RF) catheter ablation (RFCA). Cannulation of the coronary sinus is helpful to map left-sided accessory pathways or evaluate other left-sided tachyarrhythmia substrates. The latter is typically reserved for ventricular tachycardia (VT) ablations or accessory pathway ablations. Anticoagulation with intravenous (IV) heparin is used to reduce the risk of periprocedural thromboembolism. RFCA of the atrioventricular (AV) junction is the simplest catheter ablation procedure performed in patients with atrial fibrillation (AF). AV nodal modification is less effective and is not frequently performed except in an attempt to avoid pacemaker implantation. Both of these approaches are used to achieve good rate control in AF, but unlike ablation techniques in atrial tissue, neither one restores normal sinus rhythm. In addition, AV junction ablation mandates permanent pacemaker implantation. Catheter ablation of atrial tissue to cure AF continues to evolve. The procedure is technically demanding and is both more risky and less successful than AV junction ablation. Nevertheless, the observation of Haissaguerre  and others that pulmonary vein foci can trigger AF has stimulated much additional research, and there is considerable scientific excitement that this common tachyarrhythmia may be amenable to a curative catheter procedure. 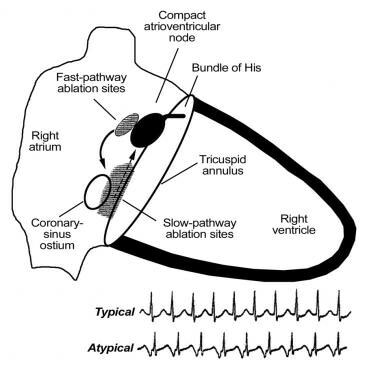 For catheter ablation of atrial tissue for AF, the most commonly used technique is a wide circumferential ablation around the pulmonary veins (see the image below). The goal is to electrically isolate rapid electrical activity arising from inside the veins, or adjacent to the pulmonary vein ostia, from the rest of the left atrium. Electroanatomic map of posterior left atrium, illustrating pulmonary veins: right superior pulmonary vein (RSPV), right inferior pulmonary vein (RIPV), left superior pulmonary vein (LSPV), and left inferior pulmonary vein (LIPV). Red circles represent actual discrete radiofrequency (RF) applications, predominantly delivered in circumferential pattern around the pulmonary veins. This ablation strategy can isolate pulmonary vein foci that initiate atrial fibrillation (AF) or alter substrate of left atrium to inhibit fibrillatory activity due to reentry. Image courtesy of American College of Cardiology Foundation. The complete surgical Maze procedure (incisions in both atria with or without transmural RF lesions) is still the most effective technique for potentially curing AF in all comers, regardless of chronicity or whether structural heart disease is present. The best success rates with left atrial catheter ablation are in patients with paroxysmal AF and hearts that are not too structurally abnormal. Atrial flutter is most commonly due to a large reentrant circuit in the right atrium, involving an isthmus of tissue between the tricuspid valve annulus and the inferior vena cava. Most commonly, reentry proceeds counterclockwise up the atrial septum and down the lateral wall of the right atrium, inscribing inverted (ie, "sawtooth") flutter waves in the inferior leads and upright P waves in V1 (see the images below). Schema of common variety of atrial flutter. Reentry circuit is confined to right atrium and circulates as counterclockwise macroreentrant circuit proceeding superiorly over atrial septum and inferiorly over lateral atrial wall. Wave front circulates through narrow isthmus of tissue between tricuspid valve annulus and inferior vena cava. Linear ablation across this isthmus (cavotricuspid isthmus) cures this common form of atrial flutter. Typical counterclockwise atrial flutter (most common form of atrial flutter in patients who have not had prior ablation). Cardinal features are perfectly regular atrial rhythm with inverted P waves inferiorly that have positive overshoot, upright P waves in V1, and inverted P waves in V6. Three-dimensional electroanatomic map of cavotricuspid isthmus flutter. Colors progress from red to purple and represent relative conduction time in right atrium (early to late). Ablation line (red dots) has been created from tricuspid annulus to inferior vena cava. This interrupts flutter circuit. Non–isthmus-dependent flutters can occur elsewhere in the right atrium, as well as in the left atrium. Left atrial flutters are uncommon, may be difficult to ablate, and generally require a three-dimensional mapping system to facilitate the procedure. In the common form of AV nodal reentrant tachycardia (AVNRT), the inferior atrionodal input to the AV node serves as the anterograde limb (ie, the slow pathway) of the reentry circuit, and the superior atrionodal input serves as the retrograde limb (ie, the fast pathway). 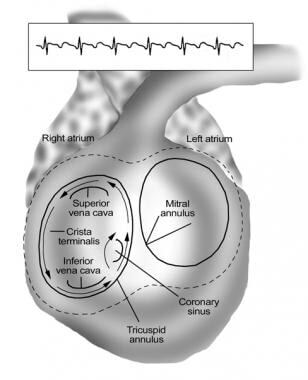 Typically, AVNRT can be cured by targeting the slow pathway near the inferior tricuspid valve annulus at the level of the coronary sinus os or somewhat higher. Diagrammatic schema of typical type of atrioventricular (AV) nodal reentrant tachycardia (AVNRT). Slow pathway (dashed arrow) is usual anterograde limb of reentry circuit and usual ablation target area (shaded). Fast pathway (solid arrow) is usual retrograde limb of reentry circuit and commonly activates atria simultaneously with ventricular activation, producing typical ECG finding of AVNRT shown below. P wave is not visible, because it is buried in QRS complex. Infrequently, reentry circuit is reversed, with anterograde conduction over fast pathway and retrograde conduction over slow pathway, producing atypical ECG finding of AVNRT shown in lower rhythm strip of figure (ie, long R-P tachycardia, in which interval between QRS complex and retrograde P wave is longer than subsequent P-R interval, and P wave is in second half of R-R interval). Fast pathway is close to compact AV node, and ablation in this area is avoided if possible because of risk of iatrogenic heart block. Pseudo S waves inferiorly are retrograde P waves. This short interval (no isoelectric baseline) between QRS complex and retrograde P wave is highly specific for atrioventricular (AV) nodal reentrant tachycardia (AVNRT). Pseudo R wave in V1 may also be observed but is not seen here. In many instances, retrograde P wave occurs during QRS activation and is not observed; this "no-P-wave" tachycardia also suggests AVNRT. 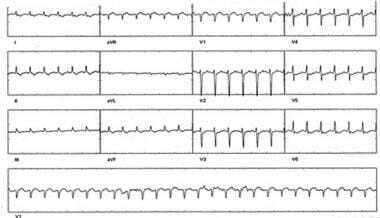 Sinus rhythm in same patient with atrioventricular (AV) nodal reentrant tachycardia (AVNRT) as in preceding ECG. Note that pseudo S waves are no longer visible. In orthodromic reciprocating tachycardia (ORT), the AV node serves as the anterograde limb, and an accessory AV connection (typically called an accessory pathway) serves as the retrograde limb (see the images below). Schema of orthodromic reciprocating tachycardia (ORT). 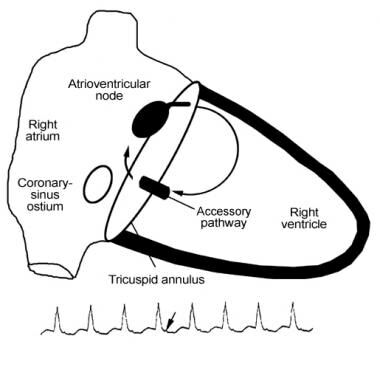 Atrioventricular (AV) node serves as anterograde limb, whereas accessory pathway (AV connection) serves as retrograde limb. Supraventricular tachycardia (SVT) in patient with orthodromic reciprocating tachycardia (ORT) due to concealed pathway. Note retrograde P wave, seen best in lead V2, separated from QRS complex by isoelectric baseline. This pattern of "short R-P tachycardia" (in which interval between QRS complex and retrograde P wave is shorter than subsequent P-R interval and P wave is in first half of R-R interval) suggests SVT incorporating accessory pathway. 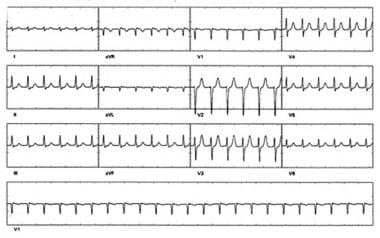 If an accessory pathway only conducts retrograde, it is termed a concealed accessory pathway because it is not identifiable on an electrocardiogram (ECG) in sinus rhythm (compare with Wolff-Parkinson-White [WPW] syndrome below). Typically, ORT can be cured by targeting the accessory pathway as it crosses the mitral or tricuspid valve annulus. Whereas ORT uses an accessory pathway in the retrograde direction, WPW syndrome by definition indicates an accessory pathway capable of anterograde conduction and is manifest by preexcitation (delta waves) on the sinus rhythm ECG. AF in WPW syndrome may result in life-threateningly fast anterograde conduction over the accessory pathway, manifested by an irregular wide-complex (preexcited) tachycardia that can sometimes degenerate to ventricular fibrillation (VF). AF in WPW syndrome may be triggered by ORT. Ablation of the accessory pathway cures WPW syndrome, eliminating ORT, as well as AF, in the majority of patients. Unifocal atrial tachycardia, which can arise from either atrium or the noncoronary cusp of the aorta, is somewhat more challenging to ablate than the more common forms of generic supraventricular tachycardia (SVT). For those tachycardias originating from the left atrium, transseptal catheterization via a patent foramen ovale or transseptal puncture is usually required. Idiopathic VT most commonly arises from the right ventricular outflow tract and less commonly originates in the inferoseptal left ventricle about two thirds of the way toward the apex from the base of the left ventricle. These forms of VT are amenable to catheter ablation, though success rates are somewhat lower than those for the common forms of SVT. VT in structural heart disease is also amenable to ablation. Some form of three-dimensional electroanatomic mapping is employed for these complex ablations to identify the scar that contributes to the anatomic substrate for reentry. Intracardiac echocardiography during the procedure and preprocedural imaging with magnetic resonance imaging (MRI) or computed tomography (CT) are also used in some instances. Anatomy from such imaging can be integrated with the electroanatomic map if necessary. Some VT substrates, especially VT in nonischemic cardiomyopathy, are not reachable from the endocardium. In these instances, percutaneous epicardial mapping and ablation are necessary. The radiation risk from catheter ablation is low, but it may exceed the risk from common radiologic procedures. The average risk of genetic defects has been computed at 1 case per million births. The average risk of fatal malignancies ranges from 0.3 to 2.3 deaths per 1000 cases for every 60 minutes of fluoroscopy. Many ablation procedures require less than 60 minutes of fluoroscopy. Scheinman M, Calkins H, Gillette P, Klein R, Lerman BB, Morady F. NASPE policy statement on catheter ablation: personnel, policy, procedures, and therapeutic recommendations. Pacing Clin Electrophysiol. 2003 Mar. 26(3):789-99. [Medline]. Tracy CM, Akhtar M. American College of Cardiology/American Heart Association 2006 update of the clinical competence statement on invasive electrophysiology studies, catheter ablation, and cardioversion: a report of the American College of Cardiology/American Heart Association/American College of Physicians Task Force on Clinical Competence and Training: developed in collaboration with the Heart Rhythm Society. Circulation. 2006 Oct 10. 114(15):1654-68. [Medline]. [Guideline] January CT, Wann LS, Alpert JS, Calkins H, Cigarroa JE, Cleveland JC Jr, et al. 2014 AHA/ACC/HRS guideline for the management of patients with atrial fibrillation: executive summary: a report of the American College of Cardiology/American Heart Association Task Force on practice guidelines and the Heart Rhythm Society. Circulation. 2014 Dec 2. 130(23):2071-104. [Medline]. [Full Text]. Rajagopalan B, Curtis AB. Management of atrial fibrillation: What is new in the 2014 ACC/AHA/HRS guideline?. Postgrad Med. 2015 Mar 7. 1-9. [Medline]. Knecht S, Sticherling C, von Felten S, Conen D, Schaer B, Ammann P, et al. Long-term comparison of cryoballoon and radiofrequency ablation of paroxysmal atrial fibrillation: a propensity score matched analysis. Int J Cardiol. 2014 Oct 20. 176(3):645-50. [Medline]. Calkins H, Kuck KH, Cappato R, et al. 2012 HRS/EHRA/ECAS Expert Consensus Statement on Catheter and Surgical Ablation of Atrial Fibrillation: recommendations for patient selection, procedural techniques, patient management and follow-up, definitions, endpoints, and research trial design. Europace. 2012 Apr. 14(4):528-606. [Medline]. Aliot EM, Stevenson WG, Almendral-Garrote JM, et al. EHRA/HRS Expert Consensus on Catheter Ablation of Ventricular Arrhythmias: developed in a partnership with the European Heart Rhythm Association (EHRA), a Registered Branch of the European Society of Cardiology (ESC), and the Heart Rhythm Society (HRS); in collaboration with the American College of Cardiology (ACC) and the American Heart Association (AHA). Europace. 2009 Jun. 11(6):771-817. [Medline]. Calkins H. Catheter ablation to maintain sinus rhythm. Circulation. 2012 Mar 20. 125(11):1439-45. [Medline]. Kuck KH, Schaumann A, Eckardt L, Willems S, Ventura R, Delacrétaz E, et al. Catheter ablation of stable ventricular tachycardia before defibrillator implantation in patients with coronary heart disease (VTACH): a multicentre randomised controlled trial. Lancet. 2010 Jan 2. 375(9708):31-40. [Medline]. [Guideline] Camm AJ, Lip GY, De Caterina R, Savelieva I, Atar D, Hohnloser SH, et al. 2012 focused update of the ESC Guidelines for the management of atrial fibrillation: an update of the 2010 ESC Guidelines for the management of atrial fibrillation. Developed with the special contribution of the European Heart Rhythm Association. Eur Heart J. 2012 Nov. 33 (21):2719-47. [Medline]. Haissaguerre M, Jaïs P, Shah DC, et al. 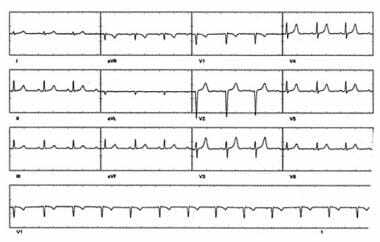 Spontaneous initiation of atrial fibrillation by ectopic beats originating in the pulmonary veins. N Engl J Med. 1998 Sep 3. 339(10):659-66. [Medline]. Perisinakis K, Damilakis J, Theocharopoulos N, et al. Accurate assessment of patient effective radiation dose and associated detriment risk from radiofrequency catheter ablation procedures. Circulation. 2001 Jul 3. 104(1):58-62. [Medline].